My first tomatoes were finally ripe enough to eat this morning. So for breakfast I had a sliced heirloom tomato and an omelet with fresh basil from my herb garden. There is something about food that comes from your garden that always tastes so much better. Heirloom tomatoes are one of my favorite foods, they are sweet and delicious. Of course my kids woke up and eat half of the breakfast I had prepared for myself, but who could blame them, it was pretty on the plate and yummy. They also ate the majority of the heirloom cherry tomatoes that are going crazy right now. There are at least 50 of them about to be ripe enough to eat. I love growing fruits and vegetables in my garden and eating the results. This week I had a number of zucchini to use so I turned to dessert recipes. I tried a new recipe for Chocolate Zucchini Cake from the July/August 2013 issue of the Food Network Magazine. This recipe has 12 ingredients. It takes 1 hour of total time, 30 minutes of which is active and makes 6 to 8 servings. I did make a number of changes to the original recipe. First I used gluten free all purpose flour instead of wheat all-purpose flour. I left out the salt since the flour I use already has it in it. For the spice I used nutmeg. Make sure to squeeze all the water out of the zucchini it really does make a difference on how the finished cake turns out. I use paper towels and wring the water out over the sink. Finally, instead of using a 9 inch square pan I baked the cake in a round 9 inch pan. I prefer being able to serve cake as slices instead of squares. The chocolate flavor in this cake really comes through. You really can't even taste the zucchini so it's a nice way to use zucchini without feeling like the entire recipe tastes like it came out of the garden. My kids loved this recipe and ate the majority of the cake by themselves. The texture is denser than many cakes, more like a dessert bread or torte. To me the texture was perfect. It was nice with a cup of coffee for an afternoon snack or would also be nice for a dinner party. 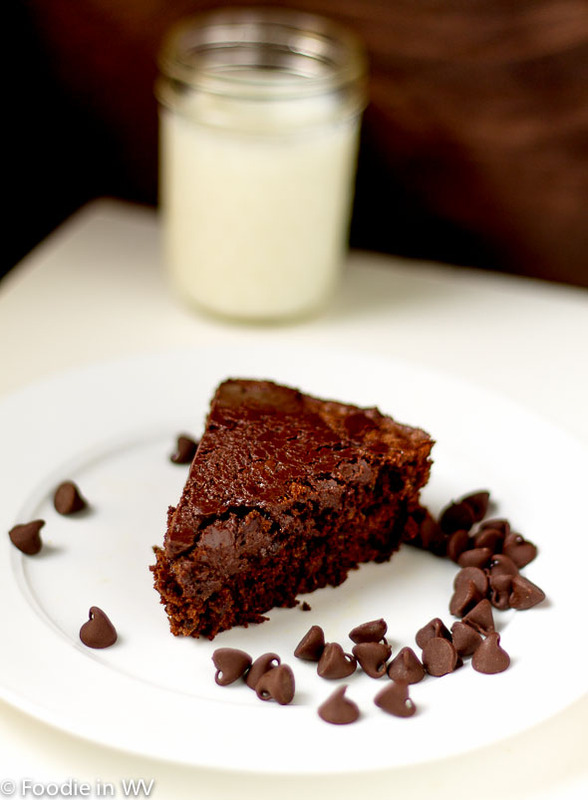 For the recipe go to Chocolate Zucchini Cake. What a great way to use up the Zucchini! My in-laws always get plenty and way too many when it's harvest time. :) This is such a treat. We normally have a ton too :) The recipe really is a nice way to use zucchini! Your breakfast sounds so good. This recipe sounds great too; I've put zucchini in a bunch of different baked goods and it turns out well. I've tried it with packaged brownie mix and that worked great. I will keep this in mind, it sounds delicious! I have also tried it with brownie mix and I agree it works really well! I agree - food from the garden is always better! This sounds like a good recipe to try! I think that I am about to have a huge crop of tomatoes as well. I love their magazine too! Your breakfast sounds just like my favorite Sunday morning one. The cake looks amazing! I've been wanting to give the chocolate-zucchini combo a try for such a long time. Love, love your recipe! I never would have thought to use zucchini in a cake. It looks delicious! It sounds strange, but it tastes delicious! I seem to have a trend lately :) Thanks for the sweet comment! You can't taste the zucchini at all, just the chocolate. If you try the recipe tell me how it turns out! I'm a big fan of zucchini too, it's yummy! I love Zucchini cake and this one looks delicious. I'm going to make some this week. I was surprised to see the flour in the recipe. I thought Gluten free meant no flour? Just curious. I switched the wheat flour to gluten free flour. There are a lot of non-wheat flours-coconut, sorghum, almond, brown rice, white rice etc. I had to re-read the post to make sure I had stated it originally :) I am so used to swapping out flours that sometimes I forget to write it in my post! You have been nominated for the Liebster Award go to my Blog to check it out ! I saw your pics and your zucchini looks great! This looks awesome! Going to give it a try this week. I am so addicted to zucchini this time of year. Nothing like it. Fried zucchini is one of my favs. I could also just eat fresh tomatoes like an apple with a little salt on them. As chocolate cake these must be terrific! I love fresh tomatoes with a little bit of salt too :) Especially straight off the vine, yum! The zucchini helps to keep it moist, plus it has a little added nutrition which is always nice! Everything you make looks so delicious! Though I still don't think you could get me to eat Zucchini if you tried, but I would try this for sure! You're sweet :) The zucchini in this you can't taste at all, I promise! delish! in terms of veggie-desserts, i prefer zucchini breads and cakes over carrot for some reason! I prefer zucchini over carrots too. Zucchini bread is so good! First of all your garden sounds amazing!! Growing your own heirlooms?? Awesome. Some day.... And I love the idea of zucchini in a chocolate dessert. Adding this to my list of must try's. Thanks :) Zucchini in desserts is great. You don't overly notice it, but you still get the nutritional value. I would NEVER have thought of doing this. WOW! It really is great and the zucchini isn't noticeable! If only I hadn't been quite so behind on my blog reading, I wouldn't have made zucchini bread today (although it too is tasty). I have been bad about my blog reading lately too :) I always get behind in the summer! Tell me how it turns out :) I wish I had zucchini in my garden! Thanks for sharing this recipe with me, Ann! Your photo is wonderful :) My sister eats GF and she will love this, so I'm going to share this with her right now. Thanks :) Tell me if she likes the recipe! This recipe looks so yummy Ann and my weakness is sweets.